Former MK Shachiv Shanaan, the father of Maj. Kamil Shanaan, 22, murdered in the deadly terrorist attack at the Lions’ Gate in Jerusalem’s Old City Friday morning, condemned the three terrorists who murdered his son and another Druze officer as "not part of the [Arab sector of Israeli society] while we [Druze] are an integral party of the state,” Ynet reported. 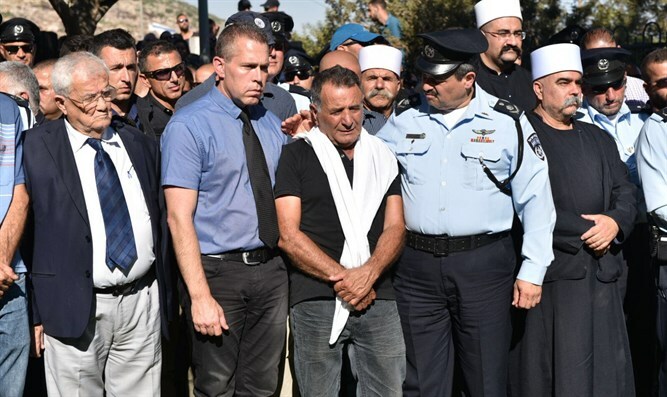 Shanaan made the comments during a condolence visit to his home in Hurfeish by Police Commissioner Roni Alsheikh, who said “we want to strengthen all policemen, especially the officers on Temple Mount." “We have Bedouin friends, Circassian friends, Muslim friends and Christian friends, not to mention Jewish friends, Jewish brothers that we live with. This country is our country,” he asserted. Earlier, Public Security Minister Gilad Erdan slammed the attack as abhorrent and cowardly. Erdan praised Shanaan, who had served in the Knesset with him. “My dear brother Shachiv. We have known each other for many years. Shachiv was always a man of peace, a man of brotherhood and friendship. We worked together … I always saw you as a friend and a brother, a man who leads the public according to values he believes in, the right values."